Trinity is a member of one of the most influential organizations within the Episcopal Church, the Gathering of Leaders (GOL). The Gathering of Leaders invites the future leaders of the Episcopal Church to gather at one of their conferences throughout the U.S. each year. GOL’s focus is simple: a passionate commitment to spreading the Christian gospel and a rich vision of the renewal and growth of the Church. 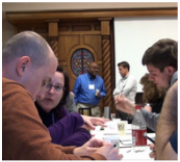 Developing and supporting transformational leaders who are dedicated to the missionary call of Christ. Growing the Church in spiritual depth and in numbers. Effectively serving humankind through the transforming power of Jesus Christ. empowerment, support, and development of such leaders.